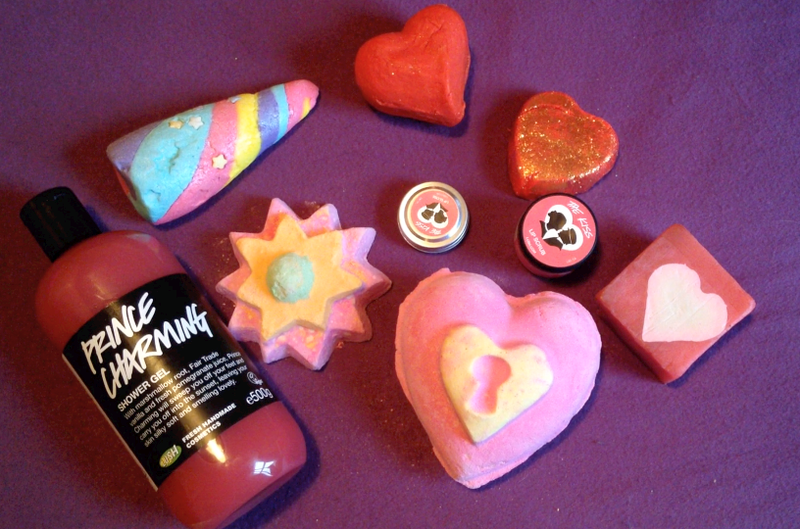 Lush products are excellent last minute stocking fillers at this time of year, and I have to admit, I’m a complete convert. You’ve got to love a company that’s a) local (Lush’s flagship store is hardly an hour’s drive from me, and it’s a British company) and b) full of heart. Lush’s mission is to create great beauty products that are as eco friendly as possible, without losing any of their sparkle. This is perfectly shown by their recent transfer to all natural glitters in all their products, and their campaign against animal testing in the cosmetics industry. 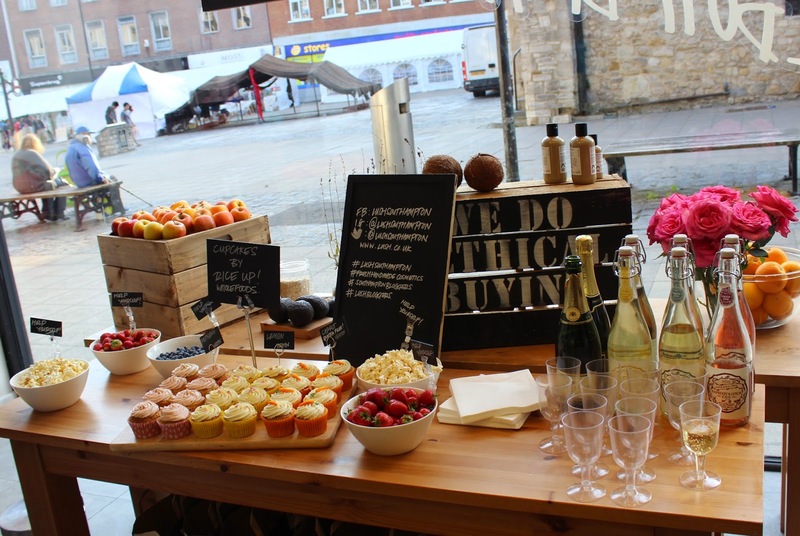 Personally, I feel good shopping with a brand that creates products full of natural goodness, without cruelty to animals and as far as possible the environment. That and their shops smell incredible. I’m not going to spend all post waxing lyrical about palm oil and the rain forests, but I think it’s great that I can get on with being pampered without guilt about where my goods are from. And the fact that so many of their products are without packaging or in recyclable containers is the icing on the cake. When I went away earlier this year I took a bunch of Lush goodies with me to make my holiday really special, from shower to seashore. Here are 10 of my Lush product must-haves that you should try, or treat your loved ones with this season. I’m going to start pretty simple and work my way up to some of the more colourful products I love, but Dream Cream is just so lovely it deserves a highlight. Cooling and calming with Lavender and super skin kind with oat milk and olive oil, this cream is great for sensitive and sore skin. I often use this on any hard skin I have, or if I have an eczema flare up. This is one of Lush’s best sellers, and it isn’t hard to see why. For me, it’s a lovely cooling cream with pretty much all of the benefits of something over the counter, but I don’t end up smelling like I rolled around a chemist’s. Really, I ought to use this more than I do (I’m famously awful at moisturising), and in the past when I have, my skin has been, well, Lush. A product that is really great for your hair is New. Packaging free, this solid shampoo bar really works. It smells wonderful- of cinnamon and cloves, and leaves my hair feeling so clean and shiny, and perfumed like christmas baking. Yum. Some people I asked said it makes their hair flyaway and frizzy. I reckon that’s because this shampoo cleases like nothing I’ve ever tried. Since my hair is a puffball at the best of times, I didn’t notice any positive or negative effect on that, but I loved the result none the less. However, without packaging, you should store this in a reusable tupperware or tin to keep it safe and from getting it everywhere when it is drying. 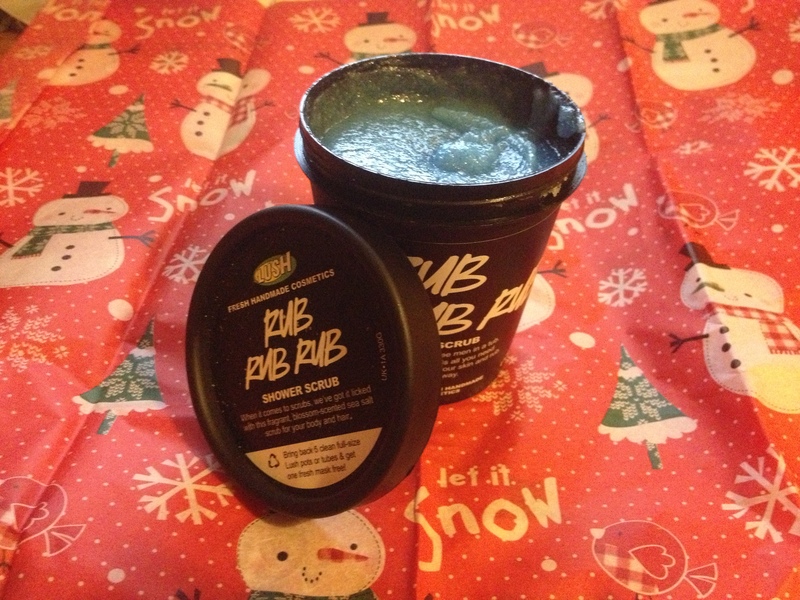 My favourite exfoliator in the world is Rub Rub Rub. It’s one of the few products that I’ve tried that leaves my skin super smooth but also really moisturised, instead of tight and angry. Like a lot of scrubs, the exfoliator is sea salt. 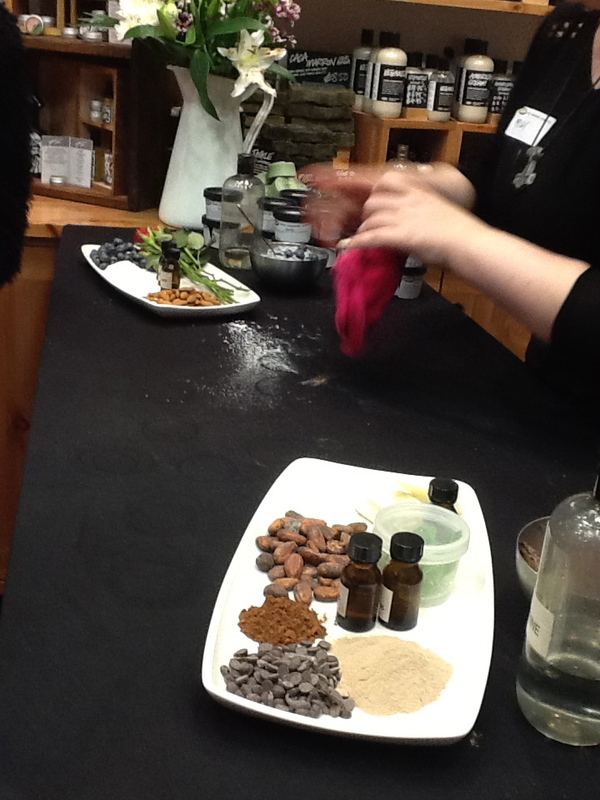 it also includes cleansing lemon, and the delicious scents of orange blossom and jasmine. The super fun blue colour goes a long way to making me love cleansing with this too. I have tried this on my face, and whilst it is too rough for me to use there regularly, it didn’t upset my skin. Apparently, it’s really good for your hair, too. This product is a limited edition, and you have to get it. It’s marketed as a shower gel, but Rose Jam is packed full of Argan oil, and it super for your hair as well as your skin. My hair is really dry, so I still need to condition after using Rose Jam on it, but’ll leave you smelling like a bed of roses. I’m not kidding, this stuff is potently rosey. It has a chocolatey quality too and really lasts on the skin, which it makes soft and lovely. I adore it, and even though the fragrance is shared by other products, I really hope Lush brings back this product after this run. I do so love a silly product name (it’s half the reason I like OPI nail polishes so much), and Chou Chou I Love You has that aspect down. 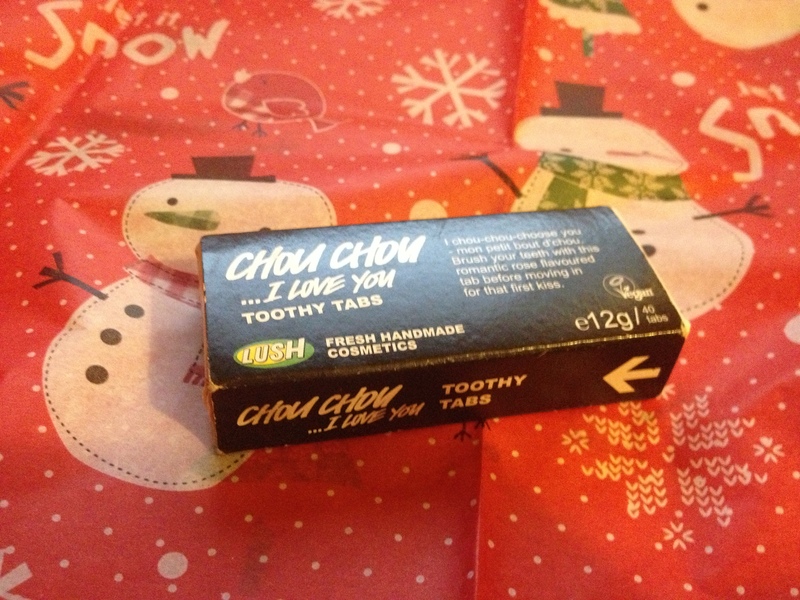 This is one of Lush’s innovative toothy tabs; a solid toothpaste formula that reduces packaging down to a recyclable card box. I love rose, which is the primary scent/flavour in this product, which is why I decided to try this one, and i wasn’t disappointed. It left my teeth really clean, and freshened my breath, and the rose/lemon taste lasted longer than I thought it would, particularly compared with flavoured toothpastes. I’m not sure I’m ready to convert entirely to Toothy Tabs, but they’re lovely to try, and who doesn’t want a rose-scented kiss from time to time? And as the cheapest item on this list, why not slip them in to a loved one’s stocking this Christmas? Lush is pretty famous for its bath bombs. They make excellent stocking fillers, and they are kind of the first thing I’m drawn to when I enter the shop. Lord of Misrule came out in time for Hallowe’en this year, and the name and green colour should give you all the Loki feels that you can take. This product, and its crown shape, are actually inspired by Pagan beliefs rather than norse, but you should buy this product for its scent, not its history. Vanilla, black pepper and patchouli give it a festive, sweet almost mulled quality I love, not to mention it turns the bath water Sangria purple. Yep- green bomb, purple bath. Fun times for all. Buy it now or lose out! 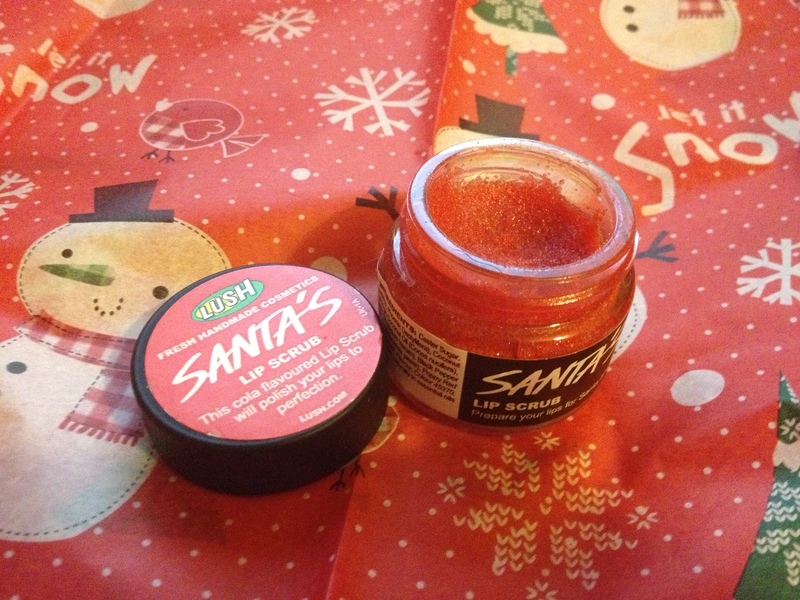 Lush do a range of sugar scrubs for your lips, but I love the flavour and obnoxious red colour of the festive addition to the range. It tastes like cola cubes, and conditions your now exfoliated lips with coconut oil. It’s a real treat, and makes me smile every time I get it out of my handbag. Like all lip scrubs, it will give you a smoother surface for applying lip colour, but this stuff tastes amazing. If you want a lip colour to match this scrub, Lush Provide with Santa Baby, a lovely lip tint that smells just like this scrummy scrub, and doesn’t budge easily. 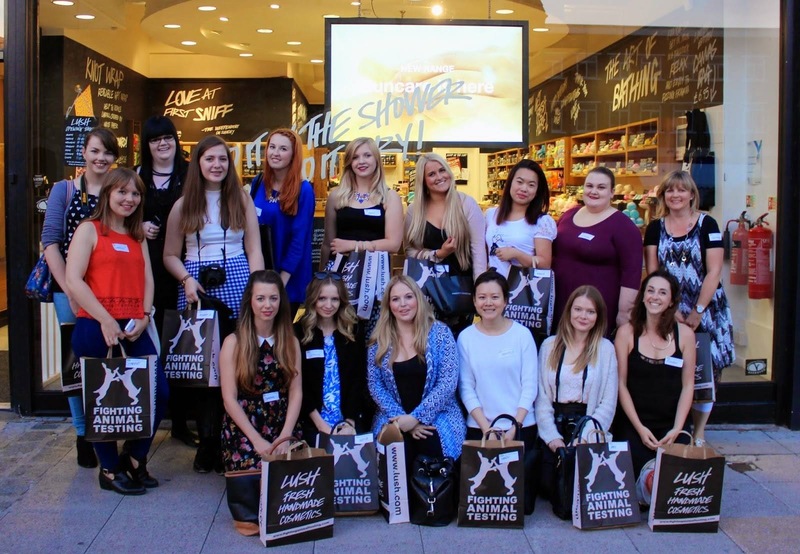 Lush have a wide range of cosmetics along side their bath and skincare products. I love my ‘Healthy’ green eyeliner, but I want to recommend one of their lovely liquid lipsticks instead. They’re long lasting and highly pigmented, and gentle enough that you could, with the right brushes, use them on your eyes and cheeks for tint too. I adore the purple-fuschia audacity of Passionate on my lips- bold as brass and lushly purple. When it comes to skin care, you can’t go wrong with that old favourite, cocoa butter. Soft Coeur, a heart shaped massage bar features this highly, and has cocoa and honey hidden inside to be revealed as it melts in your hand. The high content of natural oils mean it will easily melt with your body heat. Sure, it’s sensual to use with your partner, but I love rubbing this all over my own hands and arms at night after a day out in the biting cold to soothe, and leave me dreaming of delicious chocolatey treats. 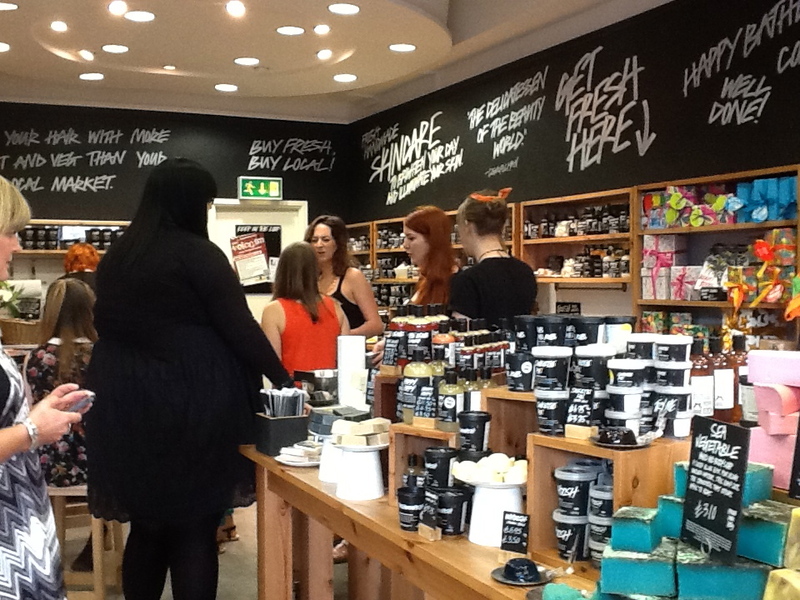 The best thing about Lush products is walking into their shops and basking in the delicious aroma of essential oils. 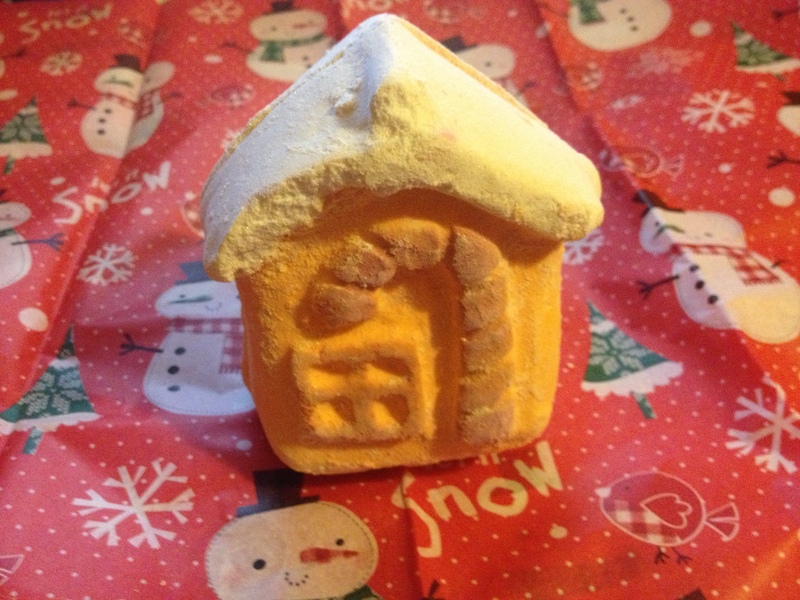 This Christmas, Lush have released an ENORMOUS bath bomb (that you could easily break into two or three before using) that features the ‘trademark’ scent of Lush, as previously captured in their 29 perfume. This bomb is so big, it has a bomb inside it- a Secret Santa! Ylang Ylang, Sandalwood, Jasmine, Lime… trust me, it smells incredible, and you deserve it. 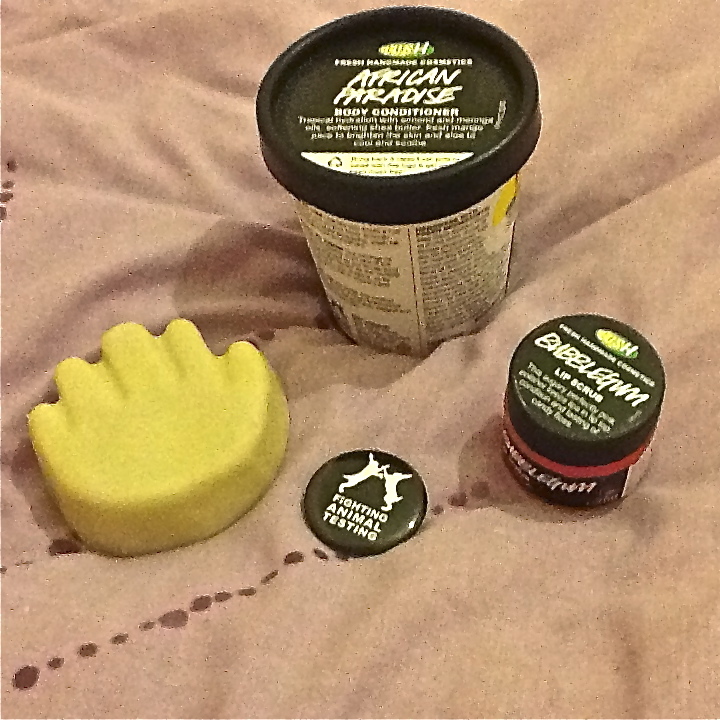 So there we are- 10 products I thank Lush for putting together for me and you to enjoy. I hope they spice up your life, for Christmas and beyond. N.B this is not a sponsored post.